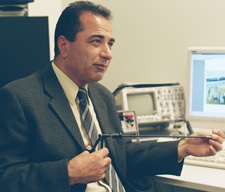 Engineering professorJavad Dargahi with a sample of the tactile sensor technology he developed for surgery. Surgical procedures are never fun, but through minimally invasive surgery, or MIS, it is possible to reduce the discomfort and scarring that accompanies such operations. Mechanical Engineering researcher Javad Dargahi is advancing these procedures through tactile sensors attached to tools inserted through very small incisions to probe internal organs. Images of the internal organs, inserted instruments and the surgical procedures are obtained with an endoscopic camera and viewed on a monitor. There is a growing acceptance of minimally invasive surgery (MIS) because it causes less damage to healthy organs and tissues than conventional surgery. There is less post-operative trauma, reduced risk of infection, quicker recovery time, and reduction in cost. However, at present, one of the major disadvantages is that the surgeon’s hands are not at the site of the operation. Perception is limited to an image that is transmitted from a video camera located in the endoscope. In his MIS research, Dargahi is targeting arthroscopic surgery, used to repair joints like the knee, as well as laparoscopic surgery, used in the abdominal area. H intends to expand his work towards microsurgery. “When we use endoscopic tools, we don’t want to damage delicate tissue, cartilage or tendons,” he said. “It’s crucial to have at least a force sensor to indicate that an endoscope is touching delicate tissue and ideally, to be able to get a sense of the position, softness, texture, pulse and even temperature. There are other potential applications of tactile sensors in general robotics. Microtactile sensors could be placed on the fingers of robotic manipulators in the automotive and aerospace industries, pharmaceuticals, papermaking or harvesting fruit at the peak of perfection. However, Dargahi’s satisfaction comes from the contribution he is making in the surgery techniques. Dargahi was educated in the United Kingdom. Before coming to Concordia’s Faculty of Engineering and Computer Science in 2001, he was at the Amirkabir University of Technology (Tehran), Simon Fraser University and in private industry. A version of this story appeared in the Fall 2005 issue of The Innovator.